Voters in Turkey’s largest cities have dealt President Recep Tayyip Erdogan a sharp rebuke. 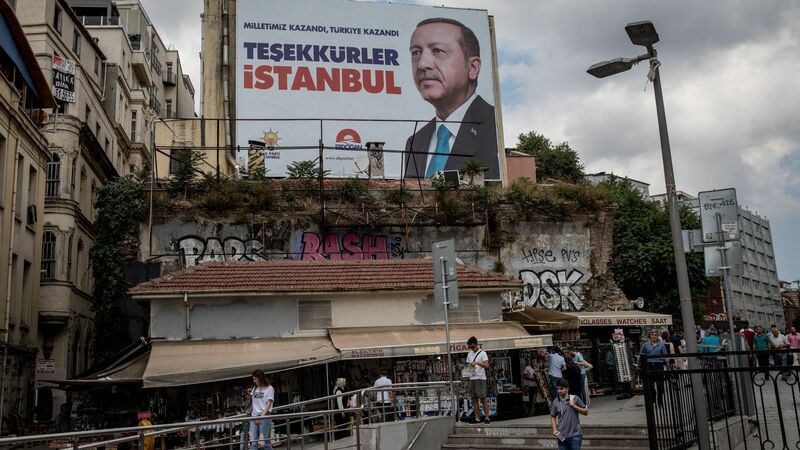 Why it matters: A sputtering economy and an uncharacteristically united opposition unleashed a tide of opposition victories in municipal elections across the country Sunday that were widely seen as a referendum on Erdogan. Erdogan wasn't on the ballot, but he campaigned vigorously for weeks. He railed against enemies foreign and domestic and suggested only he was strong enough to defend Turkey against them. Erdogan’s Justice and Development Party (AKP) and its nationalist allies did manage 52% of the national vote. But they lost control of Ankara, the capital, and are set to lose in Istanbul — Turkey’s economic and cultural center and the city that made Erdogan a national figure when it elected him mayor in 1994. Between the lines: Erdogan has increased his powers and deepened his control over the media during a tumultuous five-year period in which Turkey has had seven elections, Cagaptay says. That dynamic didn't change overnight. With no further elections scheduled until 2023, this could even be a chance for a reset — but that will depend on Erdogan’s next move. At the time of writing, the AKP has yet to concede defeat in Istanbul despite an insurmountable (though razor-thin) deficit in the vote count. Erdogan's allies have suggested they’ll challenge the results. That’s unsurprising, as Istanbul is a crucial seat of power and source of funds for the AKP. Cagaptay notes that the apparent victory in Istanbul has launched Ekrem Imamoglu of the Republican People’s Party into the national spotlight. Imamoglu was up against “nearly insurmountable odds in a very hostile media environment,” Cagaptay says. When he began to pull ahead last night, the official news agency stopped publishing results. His victory speech wasn’t even aired on the major TV networks. Still, the mayor-in-waiting campaigned skillfully and offered an attractive alternative at a time when Erdogan’s economic magic dust appears to have run out and his nationalist appeal is grating on some voters. What to watch: “He could be someone, if he does become mayor of Istanbul, who could challenge Erdogan in 4.5 years’ time,” Cagaptay says of Imamoglu. Having carved that path to power himself, Erdogan will be watching closely.